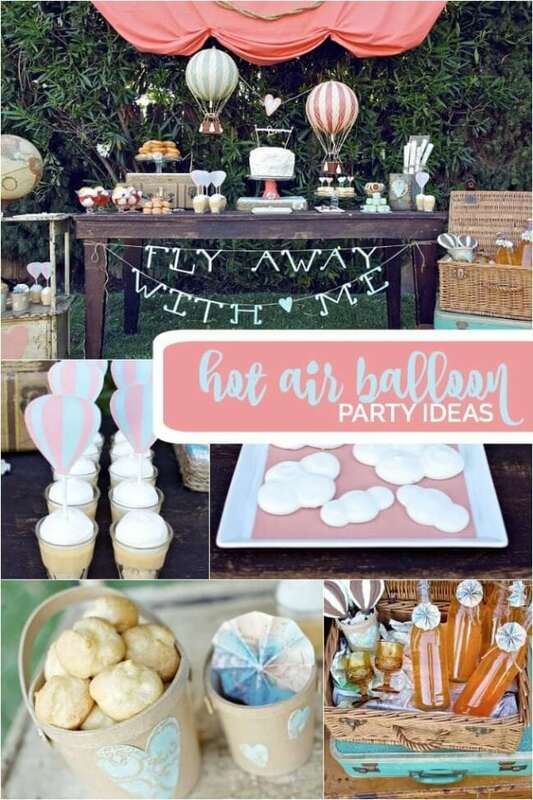 Your head will be in the clouds as you soar through these 19 inspiring hot air balloon themed party ideas! 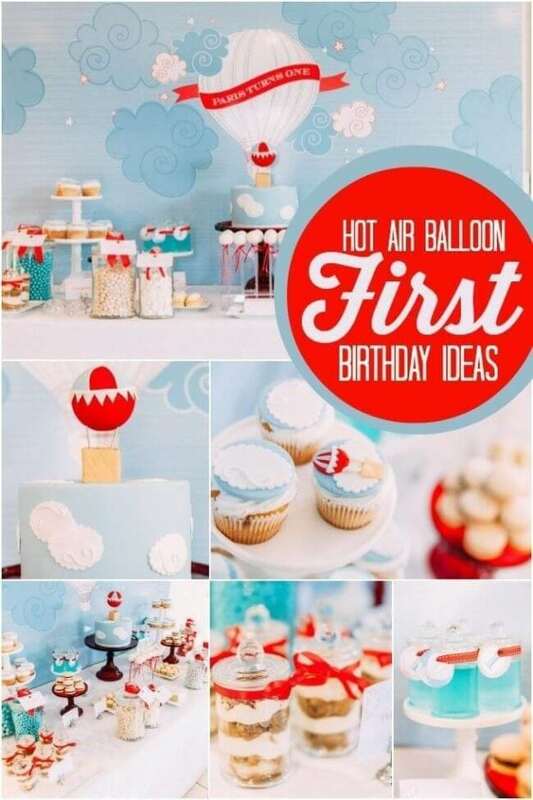 From centerpiece and favor ideas, to decorations and party supplies, to hot air balloon cakes, cupcakes and cookies, you’ll want to use these suggestions to make your party soar. Need ideas for your next hot air balloon party? 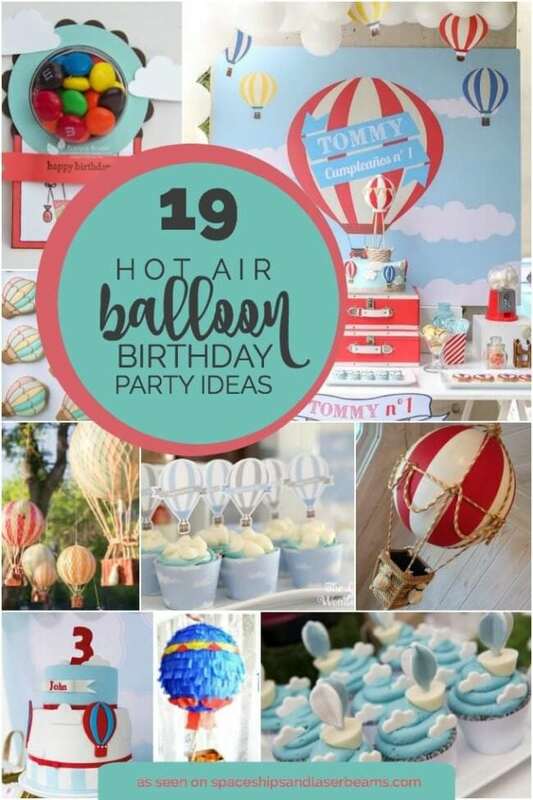 Check out this Hot Air Balloon Themed 3rd Birthday Party for lots of inspiration. Do not miss An Elegant Boy’s Hot Air Balloon Christening Party for a fun and unique party perfect for little boy’s. Take a peek at these fishing themed birthday party ideas. The sky is the limit when it comes to crafting decorations for a hot air balloon party. 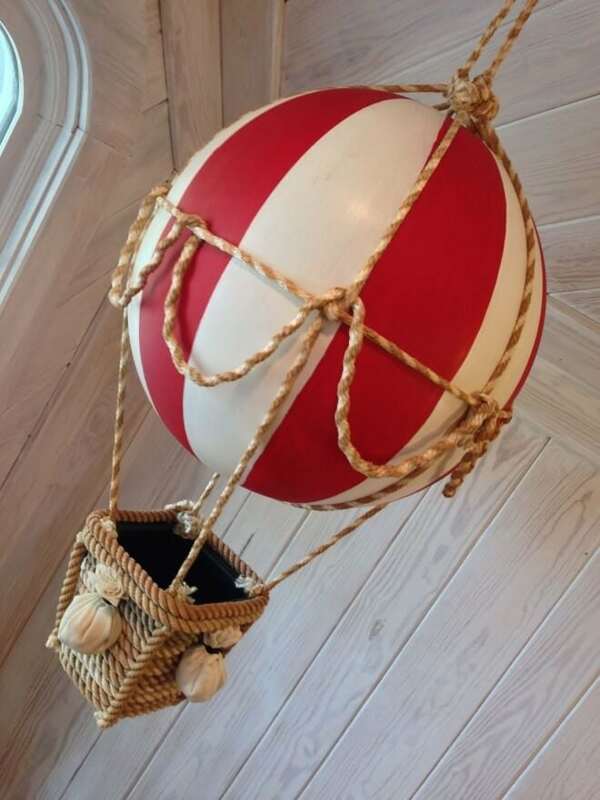 Get crafty using this tutorial to create a hot air balloon decoration using a beach ball! This would be a fabulous centerpiece on the dessert table or dining tables! Why not create cute little hot air balloon shaped party favors to hand out at your hot air balloon themed party? 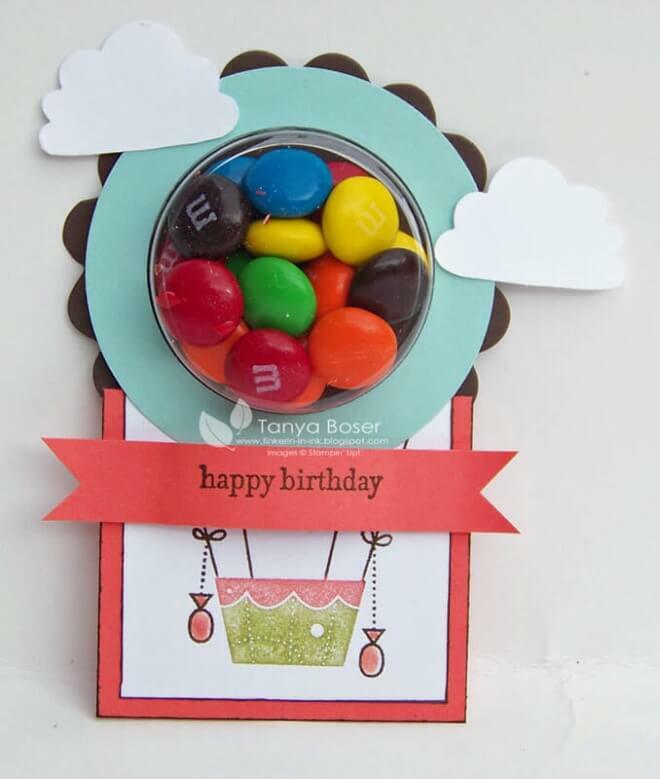 This example uses a variety of Stampin’ Up products to create, such as the treat cups, which serve as the balloon portion of the favor. Stamps and cardstock are the other major material requirements. 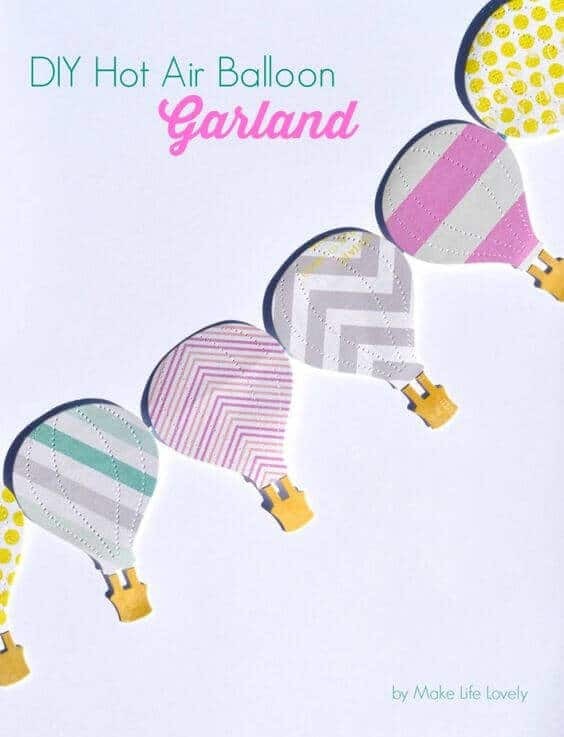 Create your own hot air balloon garland. This example features hot air balloons cut using a die cut machine, but you could also hand cut hot air balloons and tape them to twine, similar to the example. Hang the hot air balloon garland to spruce of your party space. It makes a great, inexpensive party decoration. Children really begin to soar around the time of their first birthdays. 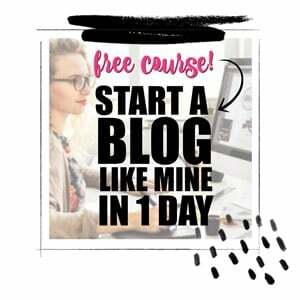 Growth and skills take off, making a hot air balloon first birthday theme a fabulous way to celebrate this milestone occasion. 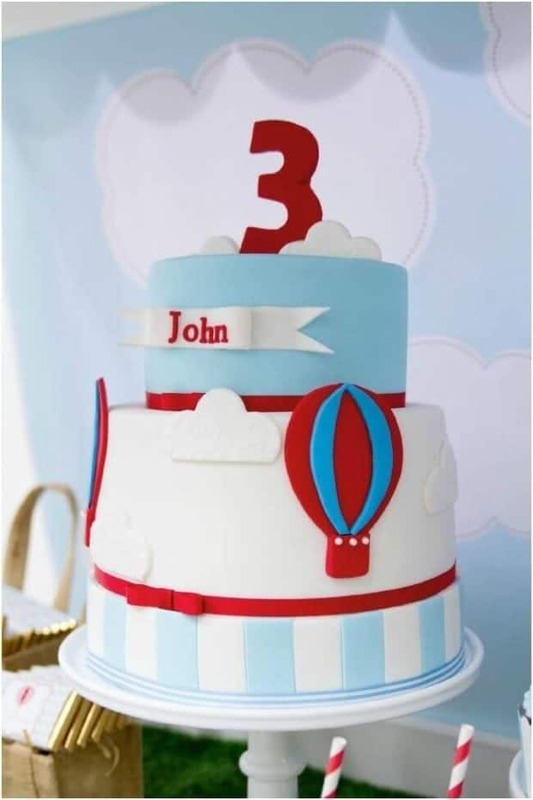 Get inspiration for party decorations, a hot air balloon cake, and party printables via this darling boy’s hot air balloon first birthday party. Have you been searching high and low for a creative cupcake idea for a hot air balloon birthday party? You can stop now. These vintage hot air balloon cupcakes will blow your mind. 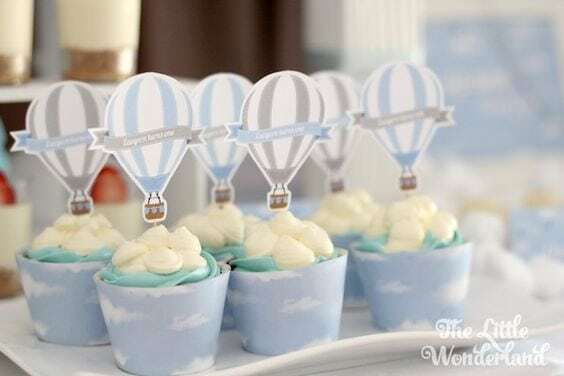 Printable cloud cupcake wrappers and hot air balloon toppers make the cupcakes take flight! Don’t you just love the creative frosting technique that makes the cupcakes look like clouds? 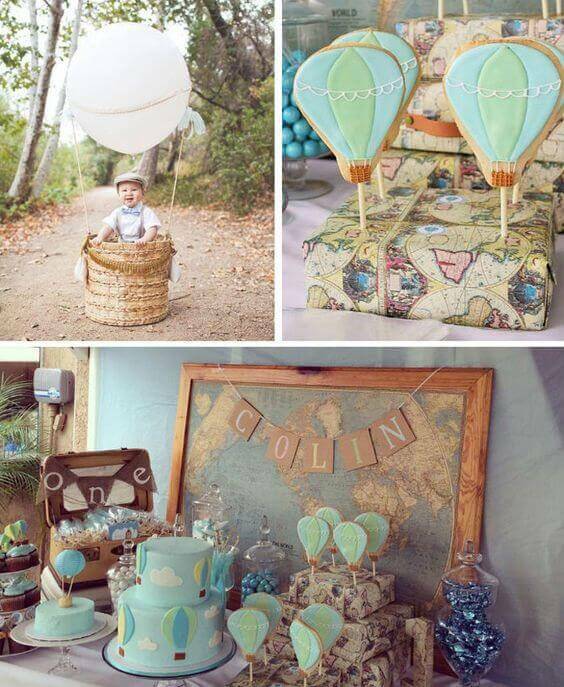 When it comes to adorable, this vintage hot air balloon birthday party sets the bar high! Look for all the ways the party styling incorporates maps—the backdrop, suitcase decorations, and even the cookie stand! I especially love the cute hot air balloon cookie pops and suitcase party favors. When it comes to a hot air balloon party, an impressive cake will leave guests on cloud 9! For a lovely example of a hot air balloon cake that is sure to create a buzz, take a peek at this darling striped cake! It’s decorated with red and blue fondant hot air balloons. The birthday boy’s age—3—is nestled amongst the clouds. I love the ribbon proclaiming the birthday boy’s name. Surprise party guests with these hot air balloon party favors filled with stuffed animals and you’re sure to be the talk of the town. This is a darling DIY. Balloons are dressed up in confetti garland and attached to small baskets. 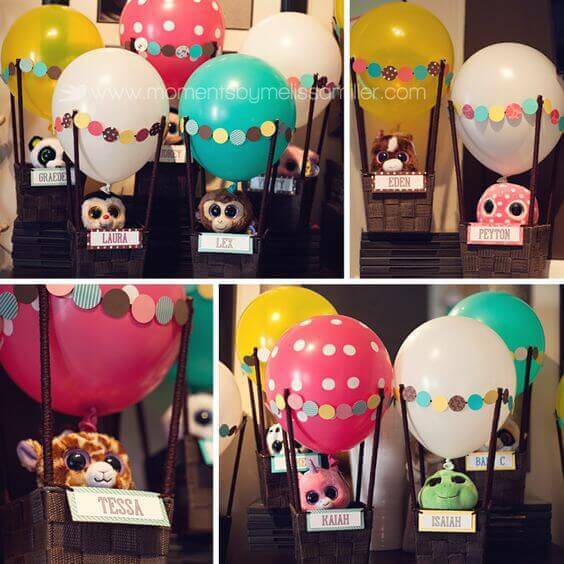 Each basket is filled with a cute stuffed animal and personalized with each party guests’ name. 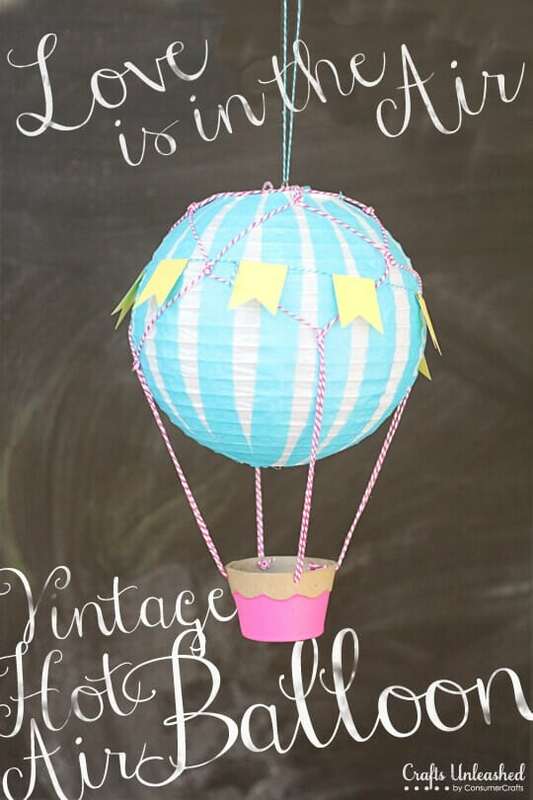 If you need to make a hot air balloon to decorate for a party, this tutorial is for you! It’s customizable to fit your personal style and party needs. The finished hot air balloon can even emit light using small LED tea lights or mini party accent lights. You will need a variety of craft supplies to complete this project, beginning with white 8” paper lanterns. As if hot air balloons aren’t amazing enough, you can now display them in adorable cake pop form. In fact, this tutorial walks you through the process of making them. I love that even the basket (minus the wrapper) is edible! Your party tables will come to life with hot air balloon centerpieces you can make yourself. 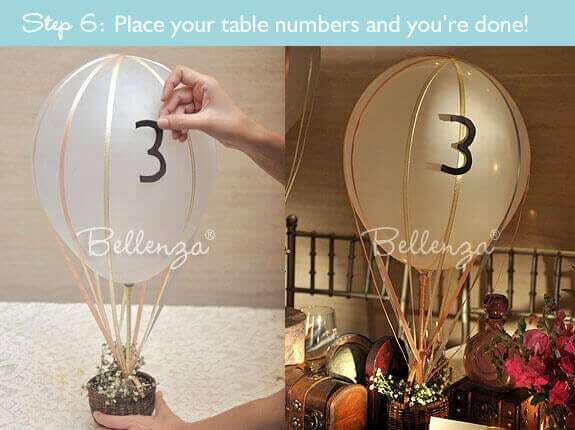 This easy tutorial will walk you through using regular balloons and turning them into small-scale hot air balloon centerpieces that can feature the guest of honors age or a table number! For this DIY project, you will need scissors, a glue gun, white balloons, small baskets, glass stones or marbles, tiny flowers, ribbons, wooden skewers, craft glue and felt numbers. Piñatas are always a hit at parties! 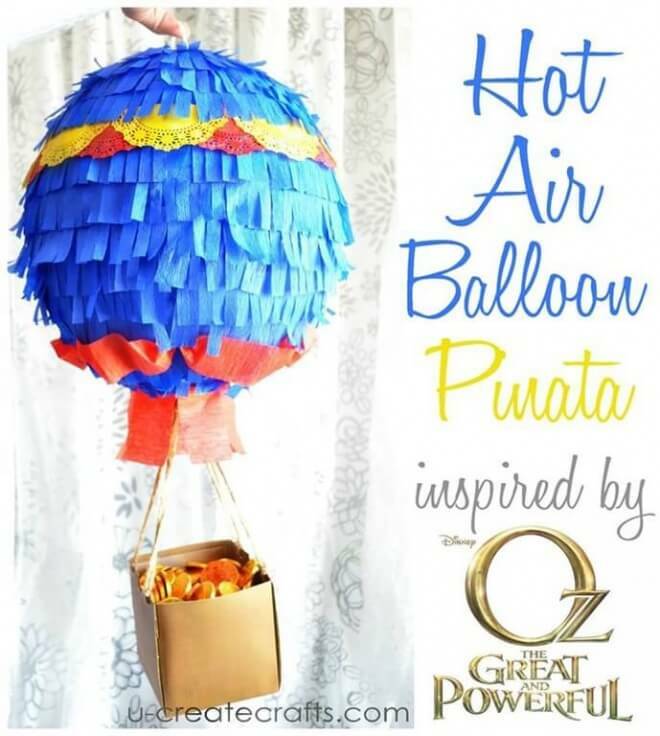 Follow this great hot air balloon piñata tutorial and be on your way to creating a fun activity for your party guests. Like many DIY piñatas, this tutorial starts with a punching balloon and uses a standard papier mache process. Weather permitting, host your hot air balloon party outside! 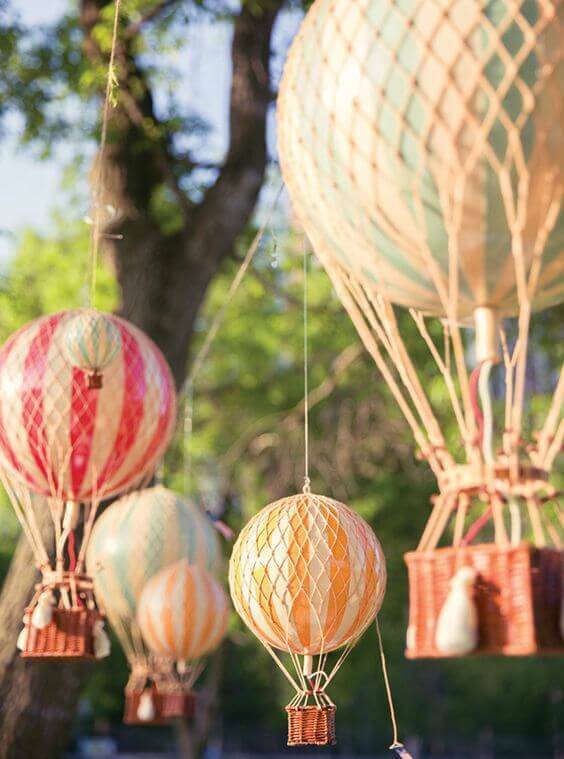 Using fishing line, hang a variety of miniature hot air balloons overhead to create a stunning visual party backdrop. Spirits are sure to soar with such beautiful party decorations that coordinate with the theme. This may be the most genius idea for repurposing an old light bulb that we’ve ever seen! 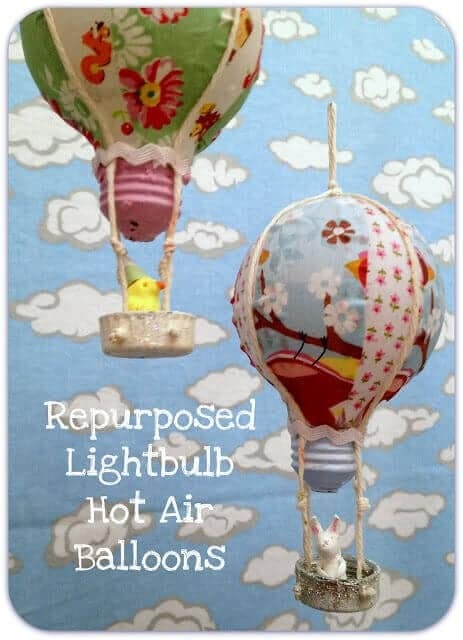 You won’t want to miss this tutorial for creating your own hot air balloon light bulbs using other items that were also destined for the trash—water bottle caps, and fabric and trim scraps. Would you believe these beautiful hot air balloons cost less than a $1 to make? What a fabulous idea for decorating a hot air balloon party and sending home with guests as a party favor. 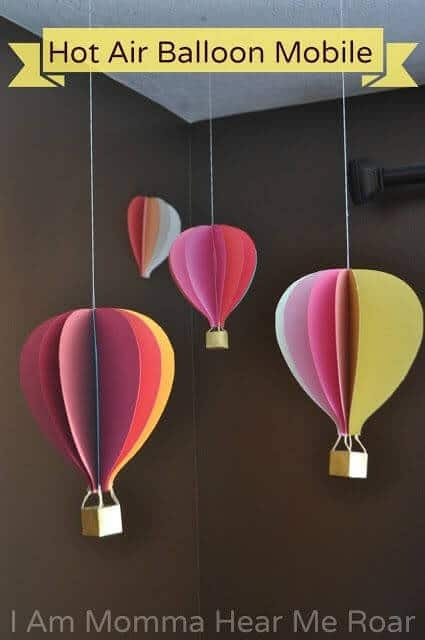 Inexpensive to make, but oh-so-cute, these hot air balloon mobiles will dress up your hot air balloon party in no time! Make one or twenty, the process goes quickly with an electric cutting machine (Silhouette) and sewing machine. You will need 7 pieces of cardstock for each balloon, and one piece of cardstock for the baskets. Embroidery thread is used to connect the basket with the balloon. Aren’t they adorable? Every Easter we are left with dozens and dozens of extra Easter eggs and have never known quite what to do with them. Now we do! 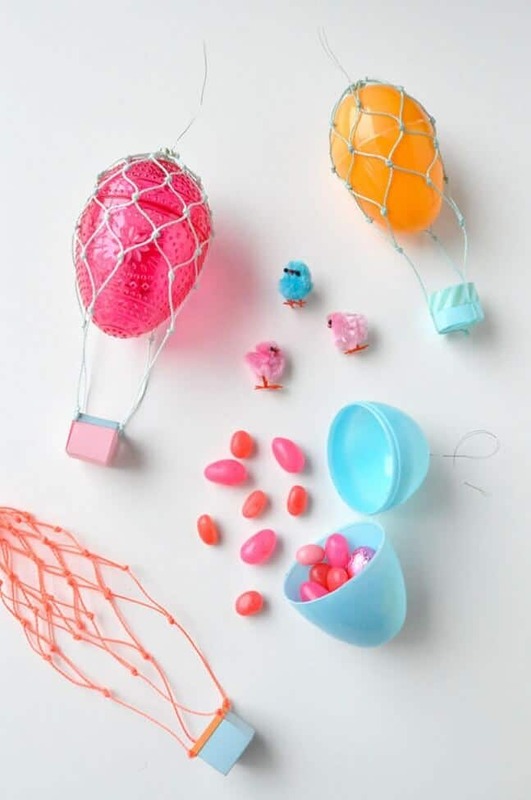 Easter eggs can be transformed into these creative treat-filled hot air balloons! It’s a quick 14 step process from start to finish and results in the cutest party favors for a hot air balloon party! A cloud-like balloon garland with printable hot air balloons cascades over a beautiful dessert table. 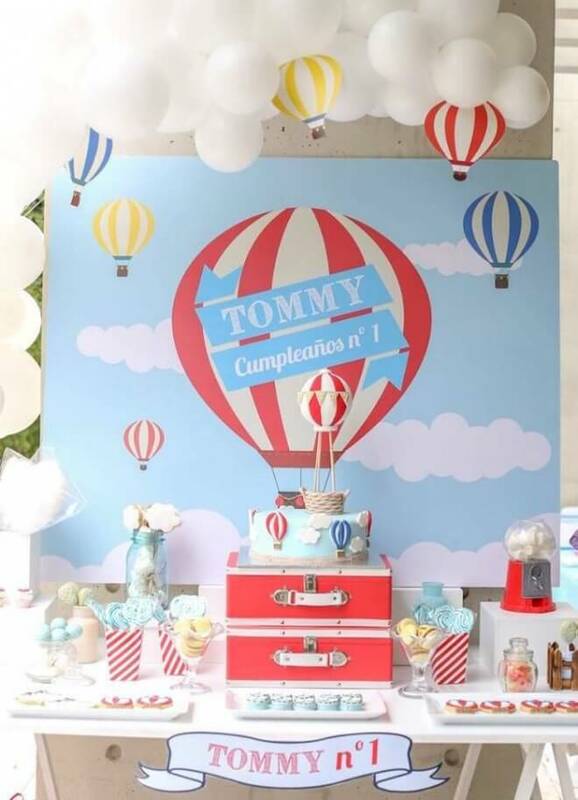 The oversized printable hot air balloon backdrop makes a perfect focal point and can be personalized to match the birthday child’s name and age. It sets the scene for a festive hot air balloon party, and is a simple project that involves ordering and printing. 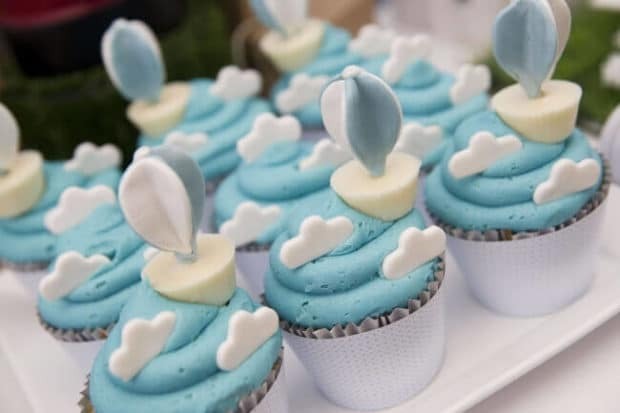 Guests will be in the clouds as they partake of these delightful hot air balloon cloud cupcakes. Piles of sky blue frosting give way to white fondant clouds and edible mini hot air balloons. 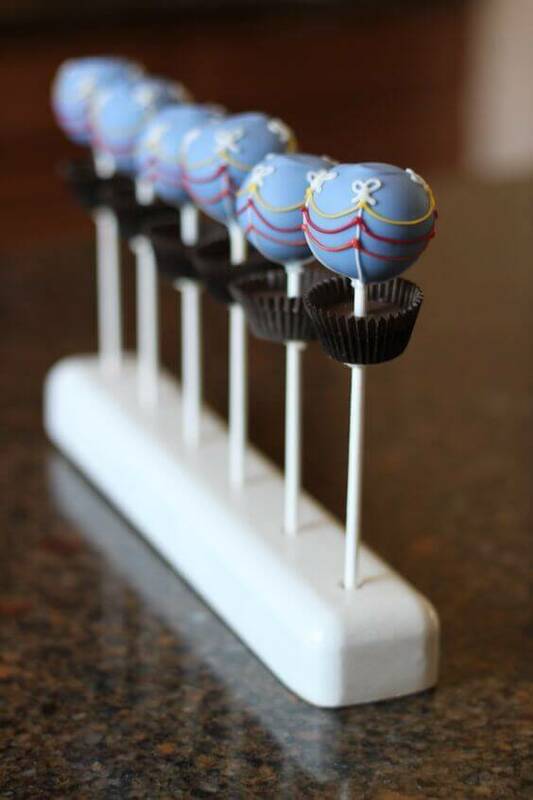 Serve up a beautifully delicious treat at your hot air balloon party! 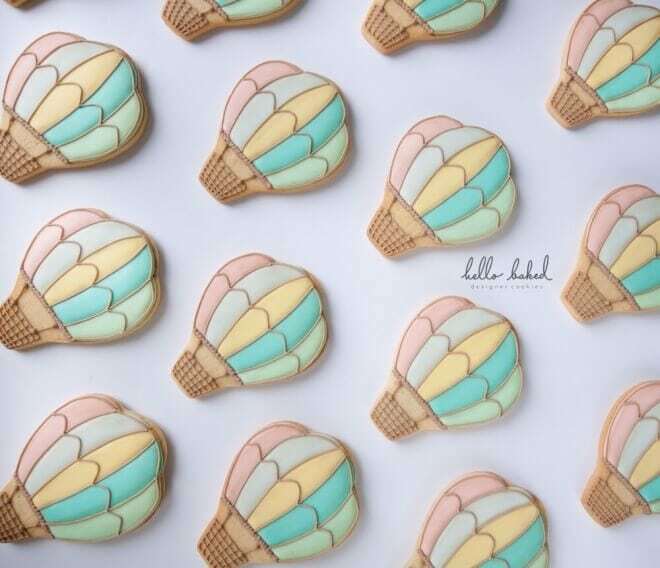 These vintage hot air balloon cookies are what dreams are made of. These pretty pastel works of art feature a quilting technique to add dimension between the different colored panels. Bronze luster dust and mahogany petal dust was also used to give these lovely cookies their vintage feel.